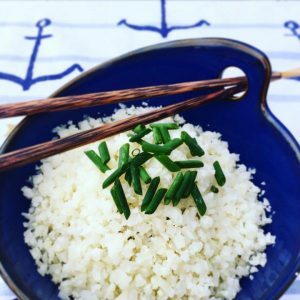 Cauliflower rice is a great way of getting more vegetables in your day. I was pleasantly surprised at the taste and texture being so similar to regular rice. Whether you make it yourself, buy it chilled or frozen at the grocery store (all major grocers sell it now), cauliflower rice is a healthy one-ingredient side or addition to your meal. If you buy it, notice the ingredient list will often simply just say cauliflower (no sodium or other preservatives are typically added). Cauliflower is high in Vitamin C, a source of several B vitamins and phytochemicals but low in carbohydrate and calories compared to traditional rice. Replacing some traditional rice on your plate with cauliflower rice is one way to keep carbohydrate portions in check for certain health conditions such as diabetes. 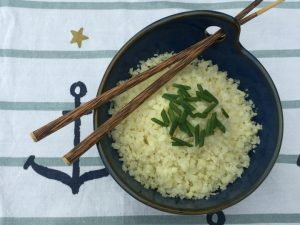 For our active family, I add the cauliflower rice to our regular rice to increase vegetable intake but keep the traditional rice portion the same to still provide a good source of carbohydrate. 1 head of cauliflower makes approximately 4 cups of cauliflower rice. cook it until it softens and then cover with a lid for a few minutes. Top with a little butter (or your favourite herbs) for a simple side vegetable dish. Great for stir fries, fried rice or burrito bowls.